A newspaper article published in The Oviedo Voice on September 16, 2004. 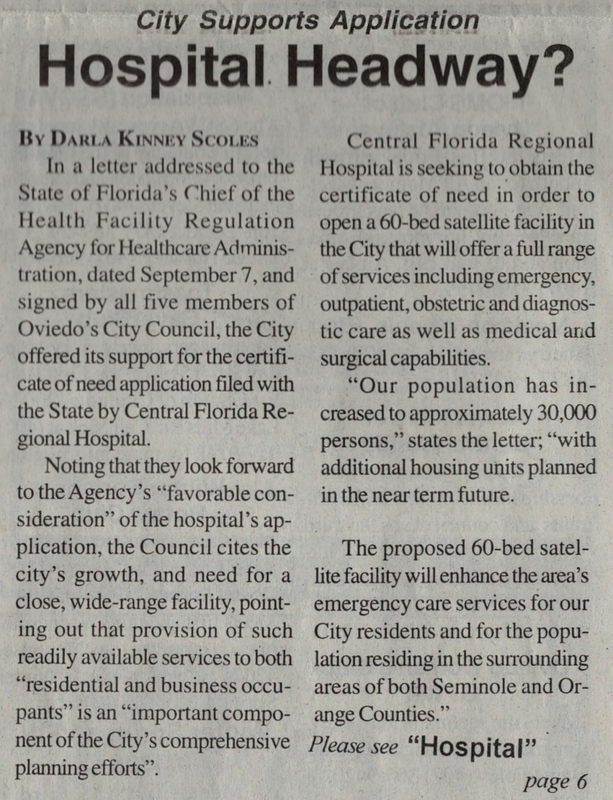 According to the article, the Oviedo City Council sent a letter the State of Florida supporting the application of certification for the Central Florida Regional Hospital, located at 1401 West Seminole Boulevard in Sanford, Florida. 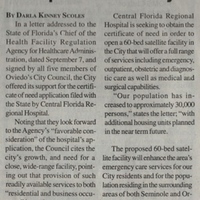 The hospital was seeking certification in order to open a 60-bed satellite facility in Oviedo that would include emergency, outpatient, obstetric, and diagnostic services. The hospital later received its certificate and established the Oviedo ER, located at 8300 Red Bug Lake Road. The article continues onto page 6 of the newspaper, which is currently unavailable. Original newspaper article: "City Supports Application: Hospital Headway?." The Oviedo Voice, Vol. XIV, No. 38, September 16, 2004, page 1: Private Collection of Edwin White and Carolyn White. Digital reproduction of original newspaper article: "City Supports Application: Hospital Headway?." The Oviedo Voice, Vol. XIV, No. 38, September 16, 2004, page 1. Scoles, Darla Kinney. “City Supports Application: Hospital Headway?.” RICHES of Central Florida accessed April 25, 2019, https://richesmi.cah.ucf.edu/omeka/items/show/6334.